I moved my BIG-IP VE Lab Edition VM from VMware Fusion on my Mac over to VMware ESXi, now that I’ve built a full ESXi 5.5 host to lab with. Here are my notes, as it was overall easy enough, but I did it wrong the first time. Maybe I can save someone a little time. Or better yet, someone can respond in the comments with an even better way to accomplish this. 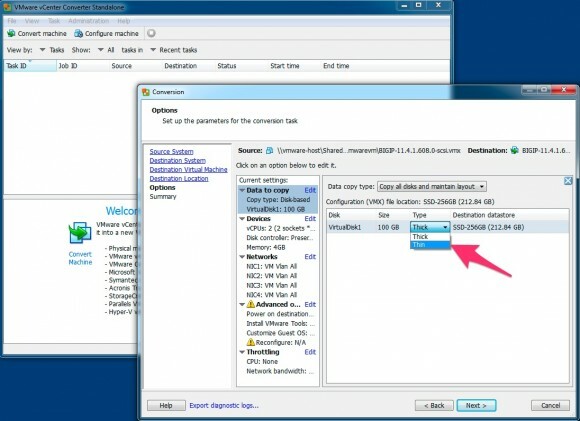 VMware provides a vCenter Converter Standalone Client. I shall call it “Converter” for the rest of this article. Converter runs on Windows, not Mac. The tool helps you migrate virtual machines from one type of hypervisor to another. You can also do physical-to-virtual conversions as well. You need an account with VMware to obtain this tool, just like you do to get a hold of the free ESXi hypervisor. Shut down the F5 VM you’re trying to convert. I don’t know that this is strictly necessary or not. It just felt instinctively like the right thing to do. Converter runs on Windows, and I happen to be running Win7 in a VM on Mac using Fusion. You can share your local Mac file system with the Windows VM via Fusion, so accessing the F5 VM I wanted to convert was easy enough. 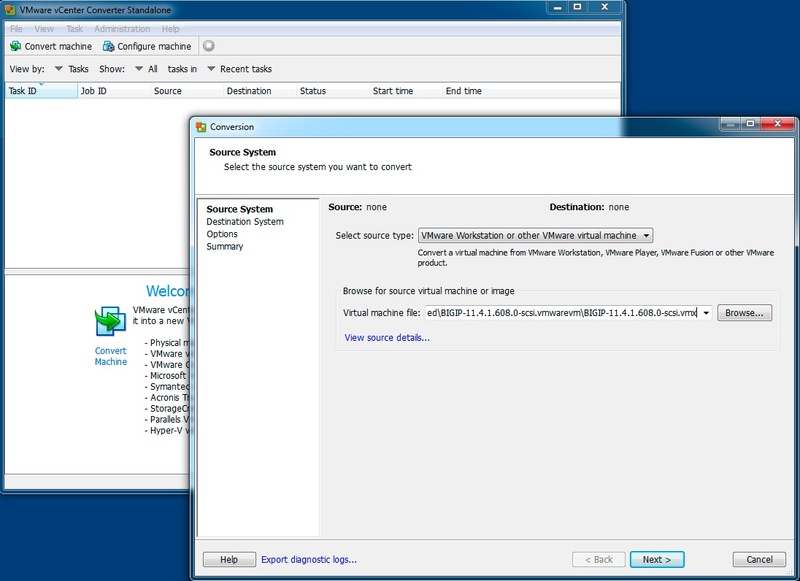 First, select “Convert Machine”, and select the source type as “VMware Workstation or other VMware virtual machine”. Then point Converter to the file location of the F5 VM. On your Mac using Fusion, by default this will be in Documents under the Virtual Machines folder. The “VMX” file is the one that tells Converter the rest of what it needs to know. From there, Converter will do some homework about the source you selected. Then you can choose the destination. If you are moving to an ESXi host (the point of this article), select VMware Infrastructure virtual machine. In the server detail section, put in the management hostname or IP of your VMware ESXi box and appropriate admin-level credentials. If your login to ESXi was successful, Converter will present you with a list of virtual machines you’re already running and ask you what you’d like to call the F5 VM you’re moving. Now it gets a little more interesting. 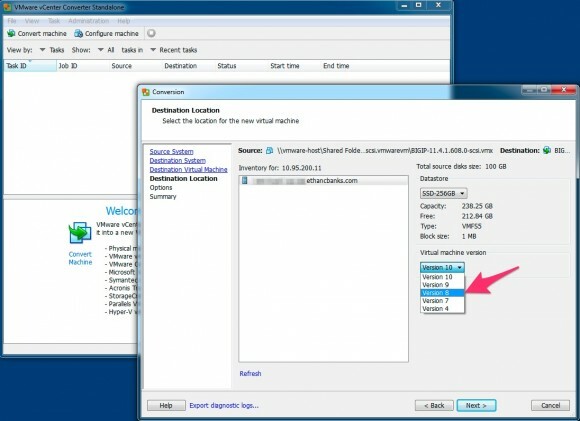 PAY ATTENTION to the virtual machine version! If you are running free ESXi (i.e. a home lab situation) and are NOT running vCenter, then do NOT choose version 10. You will not be able to manage the VM from the free vSphere ESXi 5.5 client if you do. Version 10 virtual machines can’t be managed using vSphere, meaning that you can start and stop the VM, but can’t change any of the other settings like CPU, RAM, vNIC plumbing (the biggest key here), etc. Version 10 virtual machines can only be managed by the vSphere Web Client, which is only available to vCenter users as best as I can tell. I also read somewhere along the way that version 9 can also be a problem for the vSphere 5.5 client in certain situation. So, my recommendation is for version 8. It works fine with free ESXi 5.5, and you can manage the resulting VM with vSphere without issue. My next recommendation is to provision the disk with thin provisioning, and not thick. The F5 BIG-IP VE wants 100GB of drive space, but at the moment I only have an internal 256GB SSD to store virtual machines on. Thin provisioning allows a minimal amount of disk to be taken up initially, with the understanding that it can grow over time. F5 allows the VE lab edition image to be thin provisioned, although I noticed in one of their readmes that the production VE only allows thick provisioning, i.e. all of the disk required by the VM allocated on the physical disk right up front. Thick vs. thin provisioning is under the “Data to copy” settings. Make any other changes you wish to make to the devices, networks, etc. Although…the Converter is going to pull in the settings used by the virtual machine you are converting from. So, if it was working before, you might not want to make any changes here unless you know what you’re doing. For what it’s worth, I played with the vNICs somewhere, and the F5 VE isn’t happy with less than 4 vNICs presented to it. I believe the VM thinks it is unconfigured once you boot it, something like that. It was strangely unhappy, I remember that. I’d have to break the VM again to see. Anyway…my point is to use caution messing with the VM settings further. With all the settings completed in Converter, you can “Finish”. That will publish the VM to your ESXi host across the network for you. This will take a bit of time (minutes, not hours, in my case), and you’ll see a job running in the main converter window which you can monitor to check progress. Okay, assuming you can start up the VM on ESXi, you’ve completed the conversion. But you’re not done yet. The conversion process breaks your F5 BIG-IP VE lab edition license. When the BIG-IP comes up, watch the console. It will complain that the license is junk. I didn’t think to capture the exact wording, but there’s a pretty obvious message that flies by. And when you get into the web GUI, the BIG-IP system will tell you that it needs to be activated. To deal with this problem, you need to re-apply your license. But before you do that, you’ll need to call F5 support to have them reset the license key for you. F5 maintains a central database of all licenses and the systems they are on, which prevents you from re-using a key. Support will be happy to reset the license key for you after verifying who you are, and in just a few minutes, you can apply the key to your converted BIG-IP. The new F5 virtual machine will be relicensed, and off you go. Back to happy labbing. Note that if you try to re-apply your license key before F5 resets it, the activation process will throw an error telling you that the license is already in use. 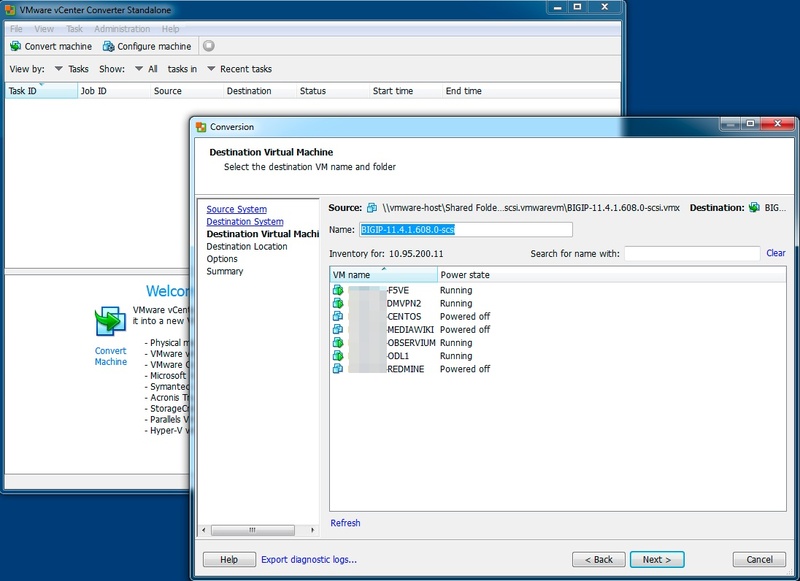 You can move your F5 BIG-IP VE Lab Edition virtual machine from one hypervisor to another using the vCenter Converter Standalone Client. When you move the VM, you probably want to use thin disk provisioning instead of thick. Your license breaks when you perform the conversion and move the virtual machine to the new hypervisor. F5 support will reset your license key at your request so that you can re-use it. Ethan, I’m surprised you didn’t have any issues with the vNIC MAC addresses changing or moving between interfaces during the migration. I’ll assume the converter maintains the mappings. If anyone does have problems (and I’ve had plenty) with migrations using other tools or VMWare products, I’d suggest the best first step is to ensure the NIC MAC addresses in BIG-IP match those listed by/in the VMWare product in question. If they don’t take a look at (just Google them) “F5 ID 366403” and “F5 SOL13149” for two solutions. Regarding your points, when you move these systems from Fusion to ESXi or any other, the configuration file is being rebuilt on the new server. Before starting that new VM or after shutting it down after a live migration, make sure you take note of the MAC Address of the original. Then, go modify the config file that defines the node on the ESXi server and you will find that the MAC address changed. Change it back and you will find that the F5 license will be still operational. While you are in the file, note that (most likely) you can (even if it is a v.10 VM) modify the device. VMware tries to keep the newer config options as you noted via the GUI limited but by no means are you limited in changes to the text files. Very useful information Charles, thank you.